Roland Boal, head of industrial design at Mira Showers, emphasises the importance of investing in innovation and development. Digital showers are the latest innovation in shower design and technology, offering stylish, minimalist design with attractive features such as precise temperature control to within a degree. With the right tools and support, such as troubleshooting guides, step by steps and YouTube videos, installation is as easy as fitting any other shower. For example, with the Mira Mode the app includes useful troubleshooting features such as enabling the installer to switch the outlets if they have been mistakenly connected the wrong way, removing the need to start all over again or fit additional pipework. Consumer-friendly features, such as an app where users can ‘personalise’ their shower to suit their own individual needs including pre-setting the maximum temperature for safety reasons, as well as the length of the shower, can save both time and money. 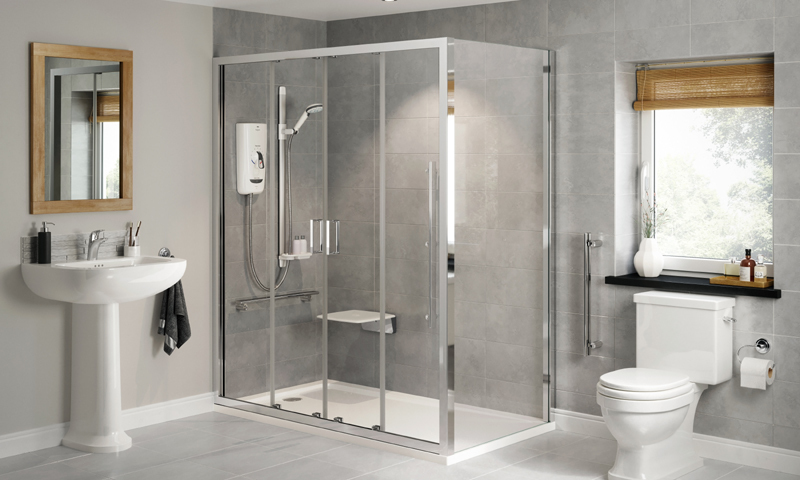 Showering manufacturers are also constantly exploring innovative features that can meet the needs of the ageing population without the need for distinctly ‘adaptation’ products. With independent living increasing, safety should be at the forefront of design in the bathing industry. Manufacturers need to consider the practical functions of the product to ensure showering is a safe and enjoyable experience, rather than a daunting prospect for vulnerable people choosing to remain at home or in social housing. Sight impairment can cause issues with showering. However, user-friendly options are available, such as the Advance, that provides black critical touchpoints highlighted against a white shower, with a backlit power button for added emphasis. The latest designs in showering technology offer critical touchpoints with high contrast graphics and raised tactile markings highlighting the all-important temperature dial and settings. This makes navigating shower controls straightforward for those with limited dexterity. With 70 per cent of over 65s opting for style over function in a recent Mira Showers survey, digital showering offers the best of both worlds, combining stylish aesthetics and the latest technology with reliable safety features for complete peace of mind. Good functionality does not necessarily mean that quality has to be compromised; proven products can be redesigned and developed, incorporating new technologies to meet the needs of the ageing population. Before any shower leaves the factory, tests should be carried out to guarantee it can deliver optimum performance and provide complete safety. If full air-tests on the product and spare parts are carried out, the end user can rest assured that the product is of proven quality. Anti-limescale technology, such as the patented Clearscale Pro ensures longer-lasting performance, while Opti-flo Pro technology enables the shower to maximise performance irrespective of water pressure, providing a consistent water flow. The Advance range, including the new Advance Flex, incorporates this technology alongside practical features specially designed for vulnerable users. The range also offers thermostatic temperature control and the BEAB Care Mark, highlighting compliance with additional safety and performance criteria to ensure safer showering for all. It is important to explore the needs of end users and enter into open dialogue with industry specialists, including occupational therapists and installers. 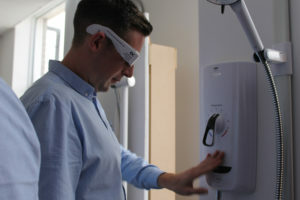 Products within the Advance range were designed following extensive research and after working collaboratively with the Royal National Institute for the Blind (RNIB) to ensure their valued approval. Implementing automated systems helps showering manufacturers to streamline their processes, while also providing workers with intelligent solutions and offering them the opportunity to upskill, ultimately improving productivity and efficiency. The adoption of automated testing processes also gives installers the assurance that products have undergone stringent quality control procedures, and there will be no missing parts when opening the packaging, or hidden surprises when fitting the product. This also prevents time delays of having to source another shower. There is now more data than ever before available to manufacturers, enabling them to tailor their offering to the unique needs of the market, improving the customer experience and overall satisfaction and brand loyalty. As a result, they can take a proactive approach, anticipating consumer and installer demand to design suitable products.